If you follow me on instagram, you saw this picture last weekend. 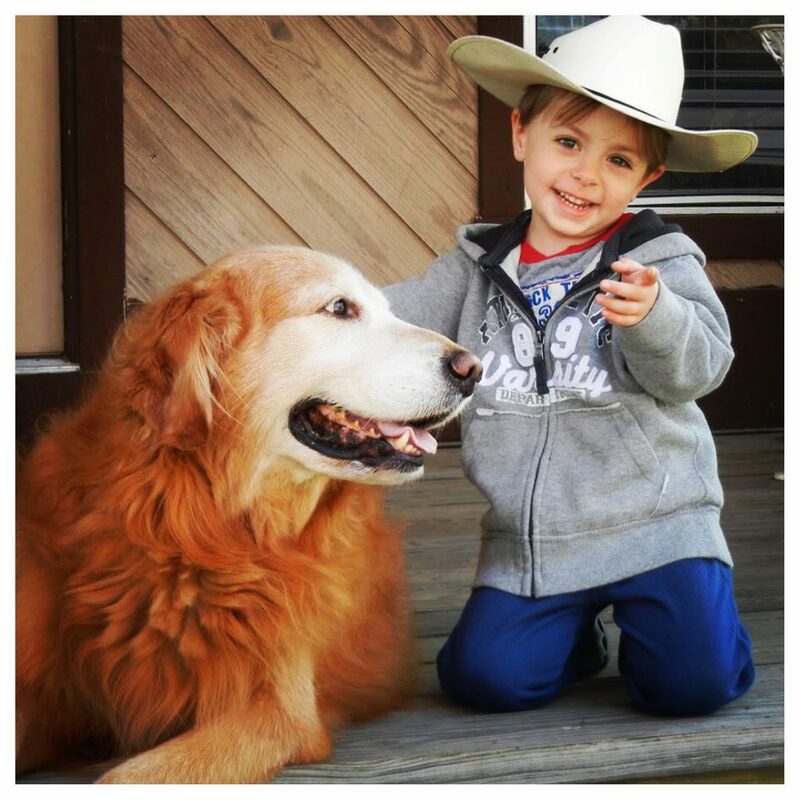 It contains three of my favorite things: my kid, my dog, and the ranch house. We still miss Scout every day, but pictures like this definitely make my heart smile. GIRLS! Stella and Dot started an amazing promotion yesterday (while supplies last). If you spend $50, you get their much beloved engravable necklace for just $19.99!!!! That’s a savings of $39! You can get a date, a name, initials, a word…whatever you like! Click HERE, add something to your cart worth $50, and then type in “engravable necklace” in the search bar and pick the $59 option. You can choose the design and font you want. This would obviously make a great Valentine’s Day gift for your mom, your daughter, your sister,….or yourself! For $19.99, it would also make a FANTASTIC teacher gift! Limit 1 per customer, you must add it to your cart yourself, and the discount will automatically be applied. I got it with the words “even more” on it. There’s no spaces between the letters (because it’s a maximum of 8 letters), but every single time we say I love you to Carter, he responds with I love you even more. 😉 I thought it would be a sweet reminder. Click HERE to shop. If you need help getting to the $50, some of my favorites follow: the arrow necklace (type in “on the mark”), I’m ordering the “Dalilah” to get to my $50, Narci has the “Victoria” necklace and I love it. And after seeing it on others, I think I need the “Guilded Path Double Wrap Bracelet” in white. It will so cute all spring and summer. I made a big deal about THESE CORDS several weeks ago, and I wore them again last weekend. They are still on sale and an AMAZING deal at $34.75!!!!!!! They are stretchy and comfy, and they come in tons of colors If between sizes, I would suggest sizing down. I’m wearing a 4 Petite. 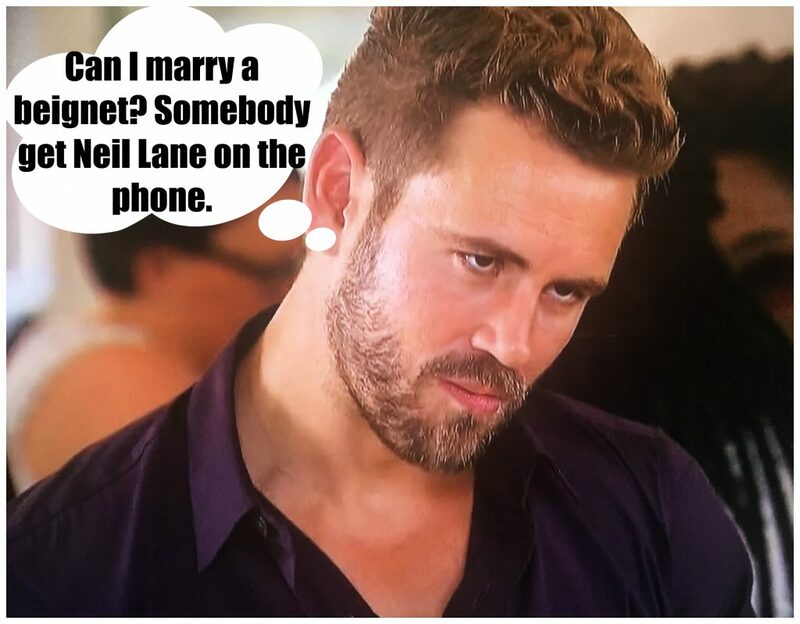 If you missed the Bachelor recap this week, shame on you! 😉 Click HERE to see it. It’s one of my favorites! And if you missed my Bachelor post, you missed THIS top too. It made me smile. It’s from PJ Salvage, but I’m think that you could totally wear it out of the house with jeans and converse. And click HERE for one that says “Rose All Day”. So a little over two years ago I found a Free People Cowl Neck Pullover that I fell in love with. And I fell hard. I got the dark grey one back in 2014, and it’s still on constant rotation in my wardrobe. And then this past year I got the wine colored one. I’ve been toying with getting the oatmeal one (on the right), but so far I’ve been strong and resisted the urge. (I actually wish I had the oatmeal one instead of the wine one, but when I bought the wine color, they didn’t have the oatmeal!) WELL. Now there’s the dusty rose one as well. Y’ALL. The power of this top might be more than I can handle. I mean, the rose color will be great all year round, but especially awesome leading up to Valentine’s Day! Click HERE. It’s a very light material, so it will transition easily into spring. I wear the x-small/small. 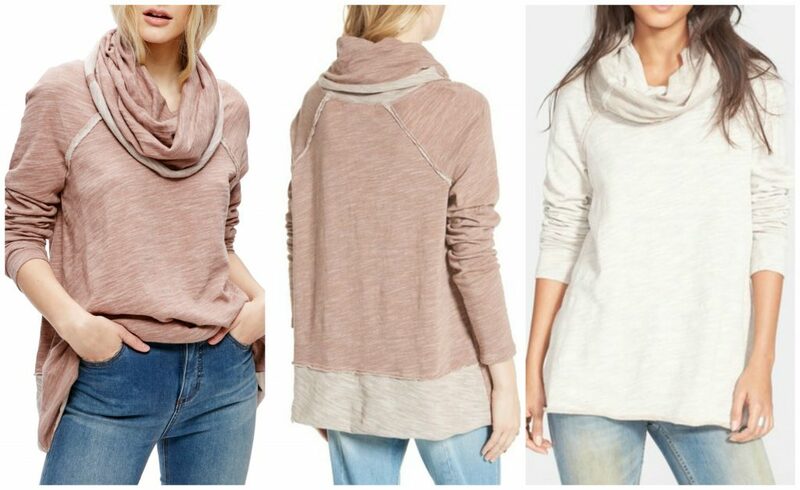 A reader left the following comment this morning, and I wanted to make sure y’all saw it, so here it is: I have 2 of those Free People tops (the grey and the rust one they used to have), and I’m going to buy the soft pink one now. I don’t even feel badly about it, because I know how much I wear the other two. It might just be my favorite shirt I’ve ever owned. I’m so excited about the pink one! 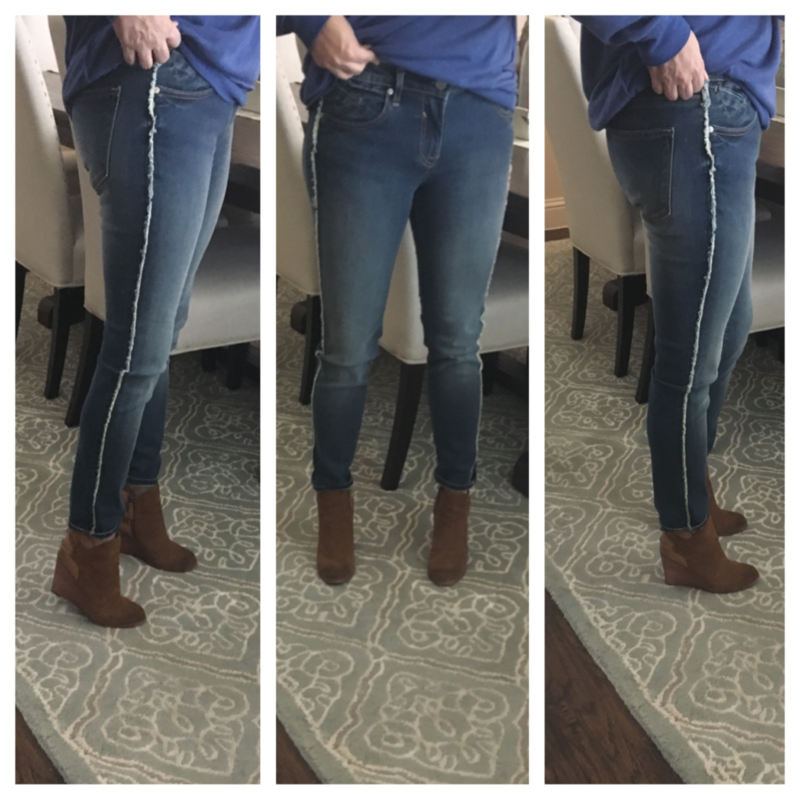 I’ll be wearing it with white jeans into Spring! Thanks for the comment, Samantha! It will be so cute with white jeans! Just for fun, I put this outfit together. The top isn’t on sale, but everything else is!!!!! 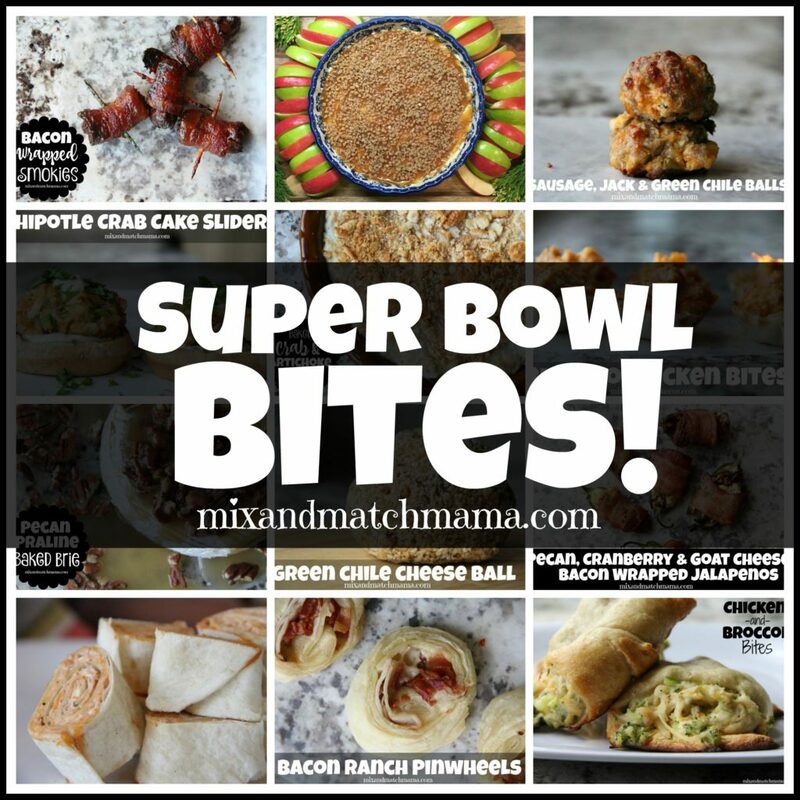 Click HERE for a collection of recipes from my friend Shay that would all be perfect for your Super Bowl party this weekend! Because we all know the best thing about the Super Bowl is the commercials the food. Y’all. THIS SWEATSHIRT is NOW ON SALE! I’m wearing a small, and I think it’s true to size. I love the small cowl neck and the wide band at the bottom (easier to see on the light grey sweatshirt). If you are going to wear it with jeans (and not leggings), you might want to consider sizing down. The sleeves might be a little short on you if you have long arms, but you could just scrunch them up and be fine. 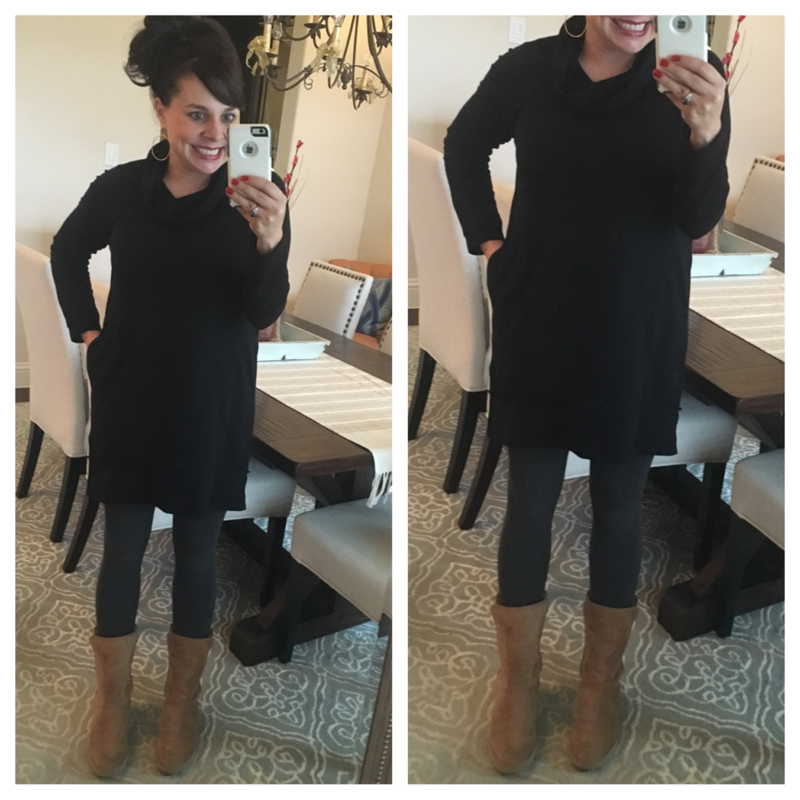 I’m wearing a small in the leggings and a 6 1/2 in the UGG boots, both true to size. And in case you want to see what it looks like with jeans….here’s a picture from the Nordstrom site…Sadly, that color is no longer available…but I love the relaxed feel with white jeans and sandals as well! Again, click HERE for the top that is NOW ON SALE! If between sizes, I would suggest sizing down. I’m wearing the 27s. They obviously aren’t going to be for everybody, but I think the frayed seam is cool! I don’t have this striped tee, but I do have it in a solid color, and it’s a great t-shirt. 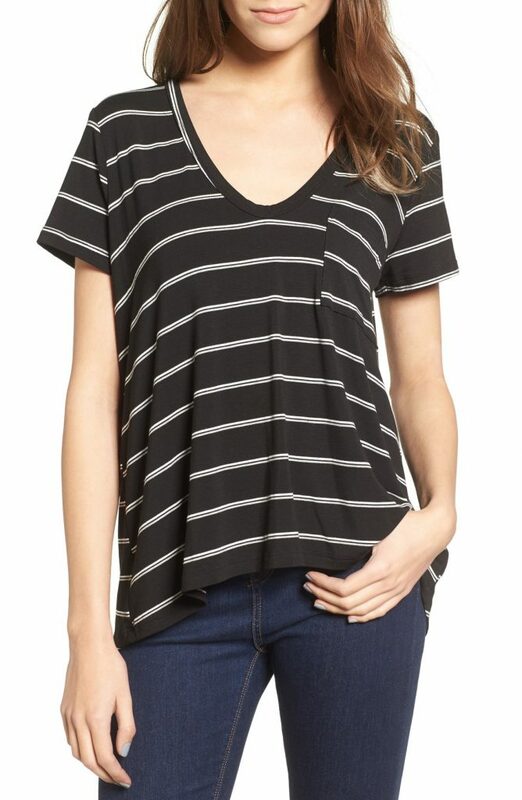 And this striped one is ON SALE for ONLY $14.40. Click HERE for the tee. The ladies at Accessory Concierge added a couple of new scarves to the scarves tab, and they extended the 60% OFF sale through the weekend!!!! 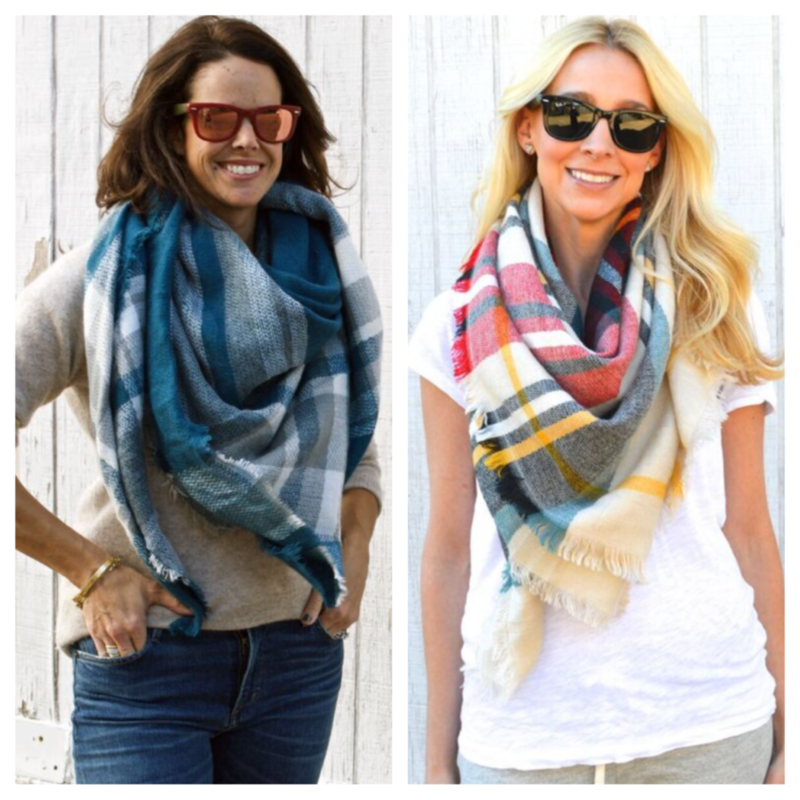 Just use the code stmtscarfsale (enter it after you hit “checkout”). Click HERE to shop all of the scarves. Now, they won’t ship out over the weekend, but they will be shipping them out Monday and Tuesday, so you will still get them in plenty of times for Valentine’s Day! Click HERE for my last blanket scarf post. For those of you that feel overwhelmed by a blanket scarf, I show you how to cut a blanket scarf in half! If you do, the scarf has a lot less fabric and won’t overwhelm you… AND you can give the other half to a friend! I’m just going to leave THIS pair of peep toe booties right here. The perforations! The Color! The Cut Out! The Block Heel! It’s all soooooo good. In the past, I’ve shared some random house pics here and there. 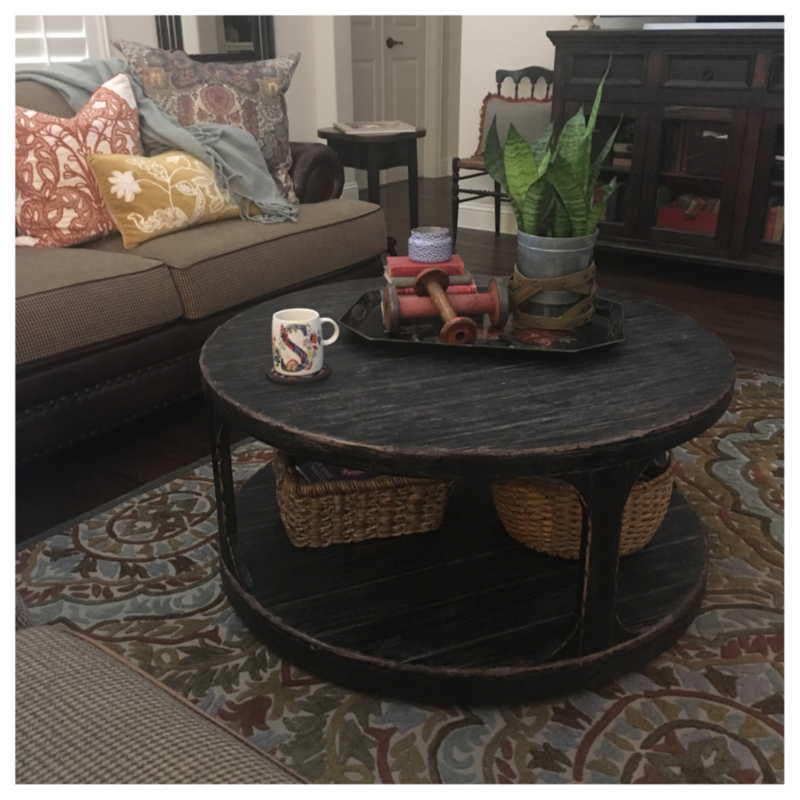 When I have, I received lots of questions about our round family room coffee table. We purchased it at Stacy furniture in Allen, but I’d never seen it online, until now!!!!! Click HERE for the coffee table. We love it. It’s on wheels (you can remove them if you wish), so it’s easy to move around. As you can see, I have a couple of baskets on the bottom shelf that I fill with magazines, remotes, etc. My decorating style is very traditional, and I love mixing old with new. For example, the wooden spools and the black metal tole tray on the coffee table were both found at antique stores. I bought the small chair (to the left of the media cabinet) at an auction the first year we were married. I actually bought a set of 4, and I have them scattered all around the house. In every room in my house I have mixed old and new items together. I think it makes it feel homey! Have a wonderful weekend with your people, and I’ll see you back here on Monday! I’m SUPER excited about Monday’s post. 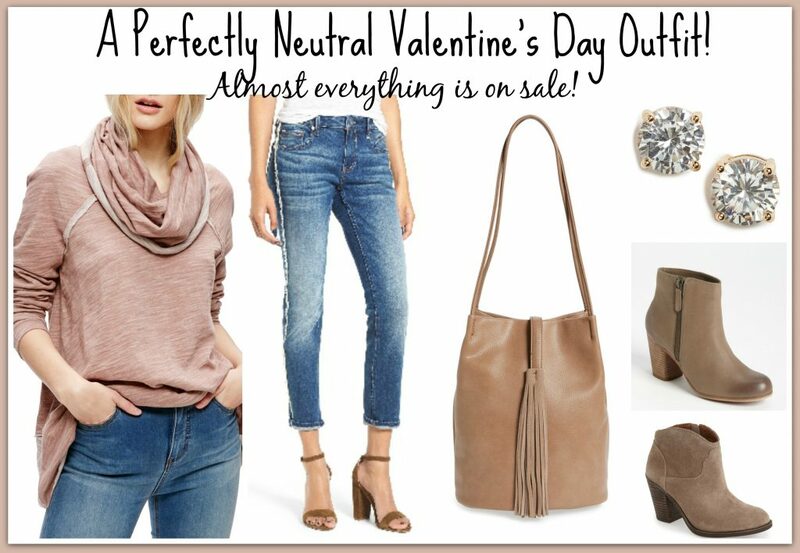 It includes an awesome long cardigan (that comes in tons of colors), a great affordable bag, and a darling necklace!!! 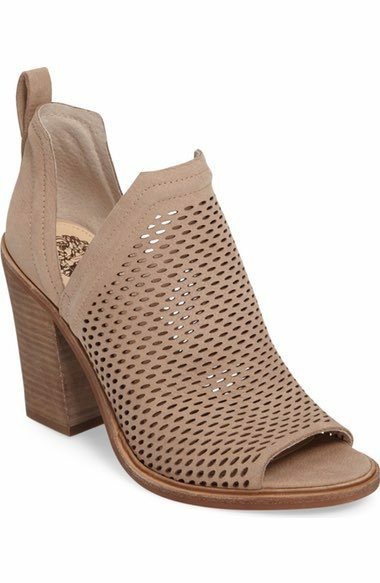 Dear peep toe booties, get in my cart now. Your living room looks SO cozy and cute! Those wedge booties…I’m swooning. And your preschool pic is my FAVORITE!! Those peep toe booties are amazing! I’m also loving that Stella and Dot necklace. Be sure to check out my Friday Favorites today for a giveaway!! Have a fabulous weekend! Also LOVE the rug. Where is it from? Do you the style name for it? I have 2 of those Free People tops (the grey and the rust one they used to have), and I’m going to buy the soft pink one now. I don’t even feel badly about it, because I know how much I wear the other two. It might just be my favorite shirt I’ve ever owned. I’m so excited about the pink one! 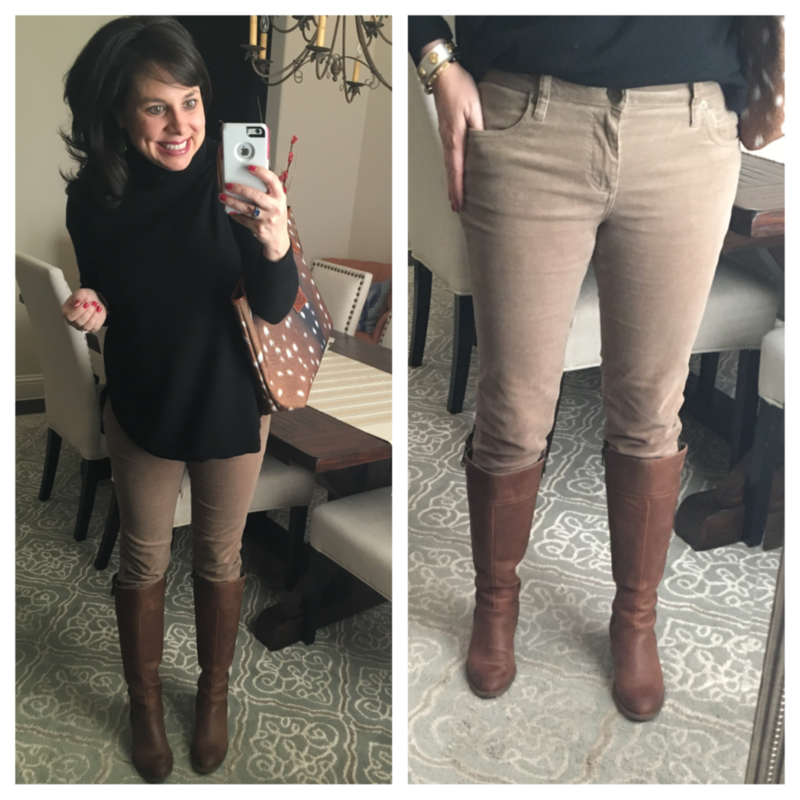 I’ll be wearing it with white jeans into Spring! That coffee table is amazing!! Where did the couch pillows come from? Those perforated booties are adorable! Also, thank you so much for linking up! Those engraveable necklaces are the best!! Love Love Love the table- actually love the entire room as I can see it from the picture. I haven’t had a coffee table in eons but this might change my mind, especially now that I’m moving home to TEXAS! : ) Side note, I don’t watch The Batchelor anymore but I live for your recaps-you are adorable and funny as all get out! We need a full house tour it looks so pretty! ! I’ve read your blog for years but dont think I’ve ever commented. However, that preschool picture of you brought me out of hiding! Your expression, the bows, and the fact that none of the other kids are smiling. 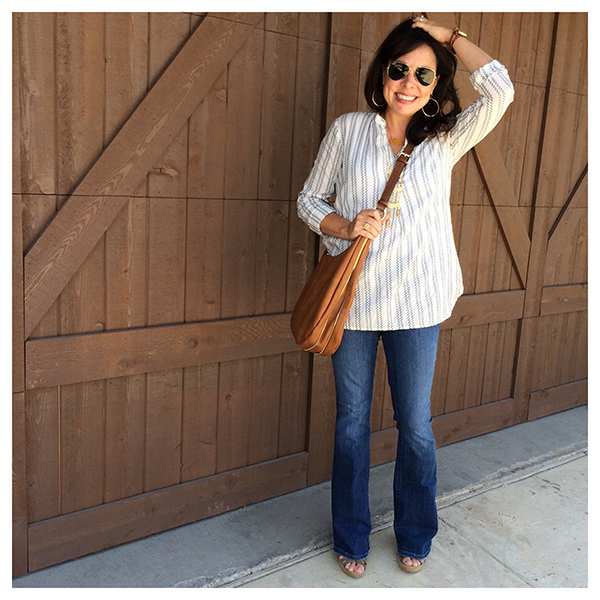 And your outfit – stripes, of course! Love, love, love it. Hello! Love your home style! Wondering if you have any bookshelves you would recommend. We don’t have enough book storage for grown up books in the office and need to expand. 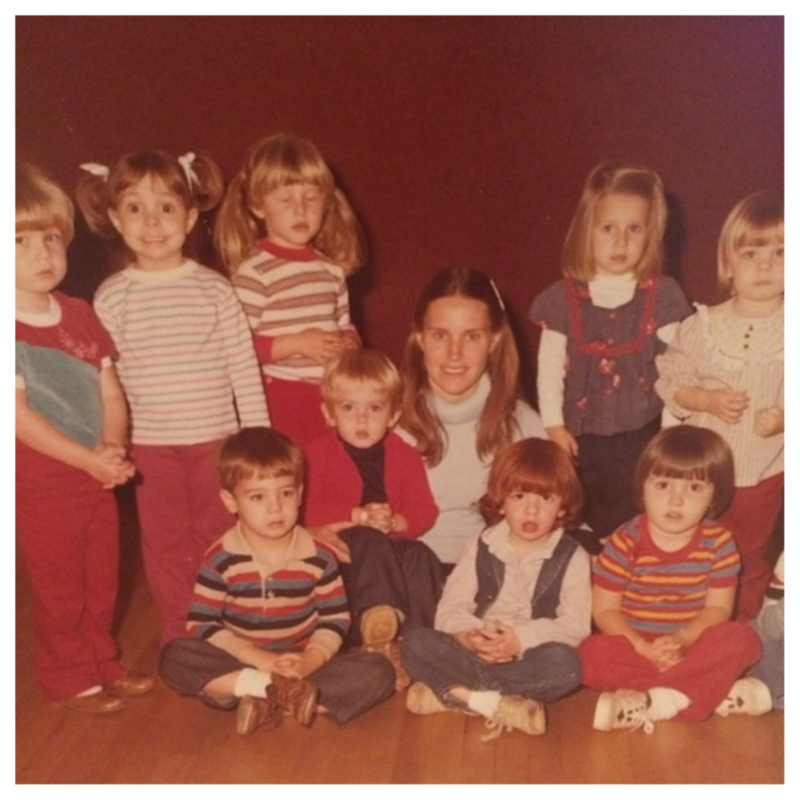 Love the preschool picture-thanks for sharing. I have some of those wooden spools and I use them in the fall as candlesticks because they just look like fall to me but I never thought of just displaying them as is. I like it! Hmmm… maybe I can pile some in a wooden bowl or a basket. You’ve inspired me! You have a good eye for decor…maybe you could do a post on accessorizing your home. Ha! I just bought those peep toe shoes this past week! They arrive next Wednesday and I cannot wait! Love the look! Your living room is done so right! Love mixing old and new! I am loving the slouchy, lounge tops you posted too! 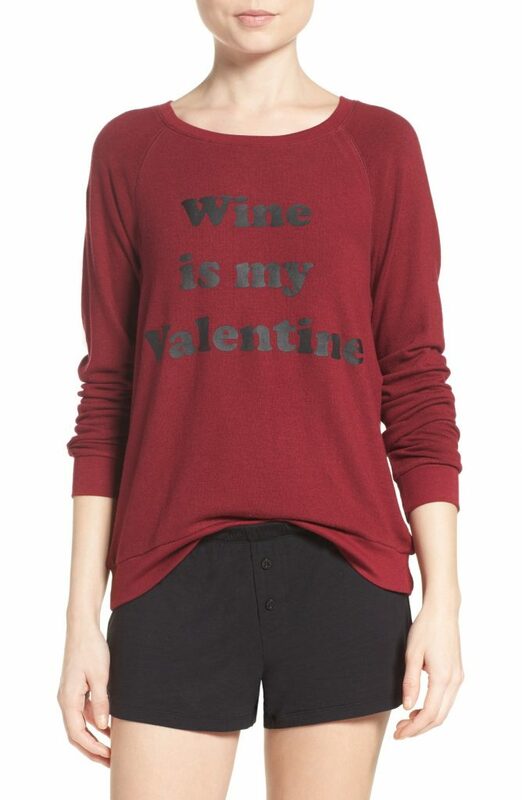 I have the WINE free people pull over. I also wanted the Oatmeal. I later got the cream colored split back turtle neck one. I highly recommend it for a neutral color. You will love it. I bought the free people sweatshirt a while ago based on your recommendation. I love it! You’ve never steered me wrong on purchases. Thanks! Cute family room! The table link isn’t working. Who is the maker? Maybe I can google another way?